Feel its power when the 7-inch touchscreen folds out. 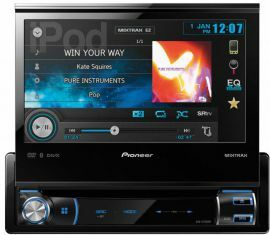 Music, Movies, Mixtrax EZ, Bluetooth, AppRadio Mode, iPod control, customisable buttons & screen. The 3 RCA High-Volt pre-outs will let you connect a series of extra amps, speakers or subs. Need Navigation on the screen? Connect the AVIC-F250 hide-away gps unit. 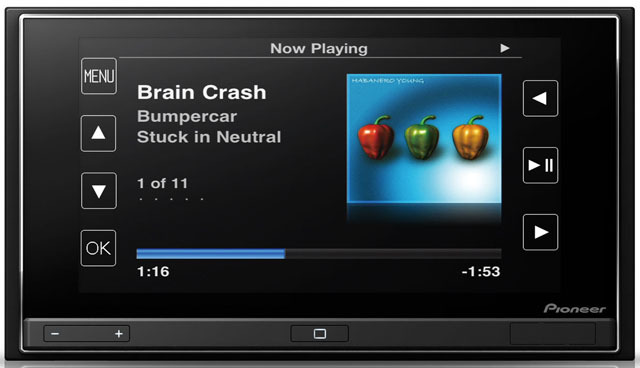 Enjoy movies & the top notch interface on the WVGA touchscreen . For Phone calls, contacts & music audio streaming. Connect iPhone4/4S/5 easily via the specific iPhone connectivity kit (Compatible iPod touch is supported too). Control compatible smartphone apps directly from your car dashboard. CD, DVD, USB, Aux-in, A2DP, DivX. iPod ready Yes, with optional ipod cable .